A NEW supermarket has opened on the Coast and it has created 15 jobs. Imran Bandi has opened a Foodworks on the ground level of the Moko waterfront apartments at Birtinya. Mr Bandi said the store would provide fresh fruit and vegetables, pre-prepared ‘Grab and Go’ meals as well as a range of community services. He said the store would employ up to 15 full and part-time staff to service customers from 6am until 9pm seven days a week, 365 days a year. 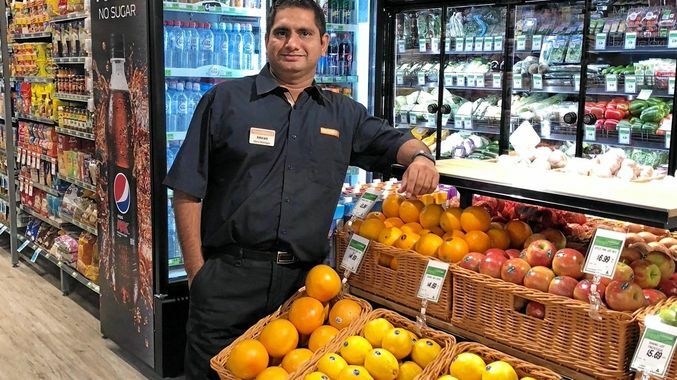 “I’ve built a really solid business at my Foodworks store in Buderim and we plan to continue this at Birtinya which is a growing community that includes professionals, growing families and retirees,” he said. “I have more than 15 years’ experience in the supermarket industry including a stint with Tesco in the UK and I bring this and more to both our stores. Mr Bandi said they would have an online shopping portal where customers could order and collect in store or they could deliver to their home or workplace. “This has been particularly popular in Buderim where we service a number of retirement villages and elderly people who still live at home,” he said. Mr Band said he was also keen to support local suppliers by sourcing the vast majority of fruit and vegetables, milk, yoghurt and other household items from locals. “The Foodworks business model is based on supporting locals so we’ll also be keen to contribute to local sporting clubs, schools and service groups as we know they are the lifeblood of any community,” he said. Ray White Mooloolaba sales agent Brent Higgins said it was pleasing to see the Moko project come together with both the residential and commercial components attracting strong interest. “We are really excited to finally see the Foodworks store open as we’ve been in discussion with Imran for quite some time and I know he’s been eager to open the store and become a part of the local Birtinya community,” he said.